Set a goal. Make a plan. Save automatically. This Military Saves tagline and motto may sound easy enough, but what exactly does it mean? 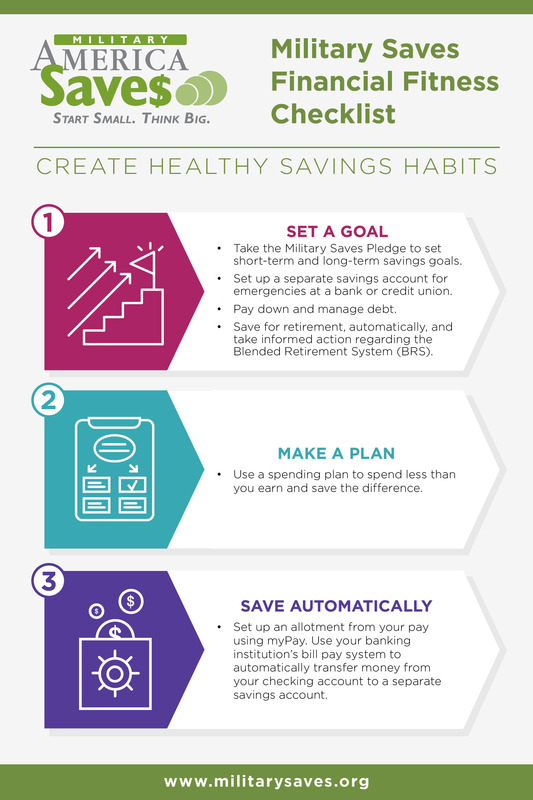 What we’re really talking about is creating healthy savings habits. But isn’t a habit a negative thing? Not when it comes to doing these three things and making it a part of the way you live your financial life. It’s said that it takes 21 days to create a habit. This Military Saves Week, Feb. 26-March 3, 2018, start creating healthy financial habits by taking the Military Saves Pledge to set your savings goal. Then complete one step each week through the first part of March and be on your way to financial fitness just in time for spring. You can do it! Military Saves Week is coordinated by Military Saves. The Week is an annual opportunity for organizations to promote good savings behavior and a chance for individuals to assess their own savings status. FINRA Military Spouse Fellowship Program Applications Open Now!